The drinkable water that comes from the public aqueducts hasn't always a good taste, you can think at the chlorine and its derivates which water contains. Causes of this problem are the increasing pollution/industrialization on our planet and the continuous infiltration in the ground and in the water tables of very different substances like pesticides and heavy metals that oblige the suppliers of water to a constant use of some disinfectants. More and more frequently we buy water in bottles, a solution that brings much other inconvenience with: economical and of storage/transport. The Cullwater offers a series of equipments able to provide light and pure water which is optimal to drink and to cook, optimal for the preparation of the beverages, for soft drinks, tea and coffee. 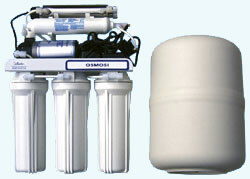 This kind of water can be used also for aquariums, irons, humidifiers and many other uses. The big functionality and the easiness in the use, the fine harmony and the limited size, for a comfortable installation under the sink, makes these systems in forefront in the field of the equipments for the purifying of water for domestic use. Dimensions: 410 x 140 x 350 mm. 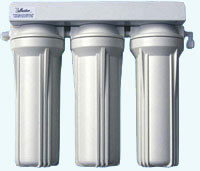 Microfiltration 3 stages of treatment with ultraviolet water sterilizer. 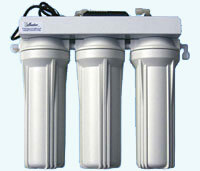 Stages of treatment: sediment filter in PP 20 micron, carbon block, microfiltration with ceramic filter 0,9 micron, ultraviolet water sterilizer. Dimensions: 410 x 140 x 370 mm. Dimensions: 410 x 140 x 450 mm. Dimensions storage tank Ø 270 x H 410 mm. 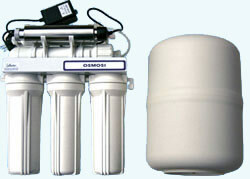 Capacity storage tank: 3,2 G - 12 Lt. Stages of treatment: sediment filter in PP 20 micron, carbon block, sediment filter in PP 5 micron, osmosis unit 50 GPD, postfiltration with carbon active Cullbon, ultraviolet water sterilizer, booster pump. Dimensions: 410 x 140 x 530 mm. Dimensions storage tank: Ø 270 x H 410 mm. All plants are built with food-use certified material and supplied with feed valve, drain saddle valve, long reach faucet and linkage tube for an easy installation.